Individual block patterns have been retired. 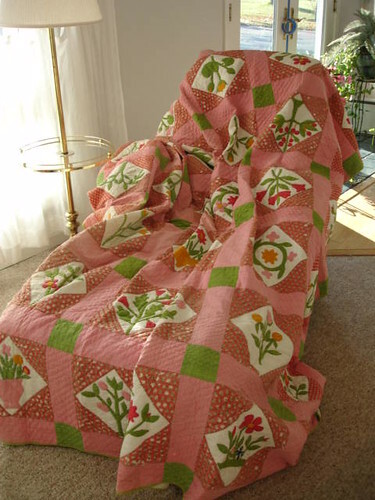 The quilt was purchased from Martha Baumgartner. She is the daughter of Lillian Baumgartner. The quilt was made by her mother's great, great, great grandmother Sally Post. She was born in March 1790. 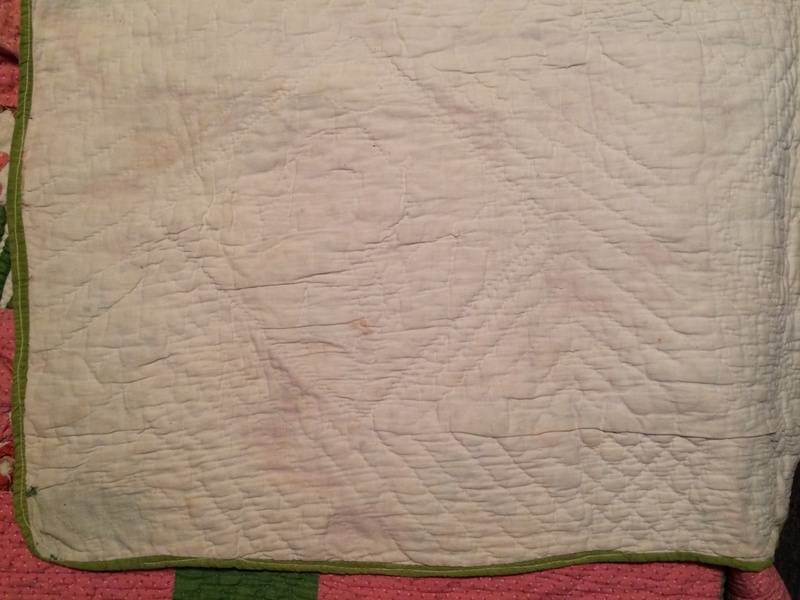 The quilt was with the family on the farm in the Baptist Hill area of Onondaga County, New York until the farm was sold. Onondaga County is in the Finger Lakes region of New York state near Skaneateles Lake. The Barumgartner family had lived on this land since the 1860's. Sally, it's a privilege to take care of your quilt and share it with others.I will be posting one block per week for the quilt. Each block will include the original "on point" setting and also sized for a "straight set" 8" block. 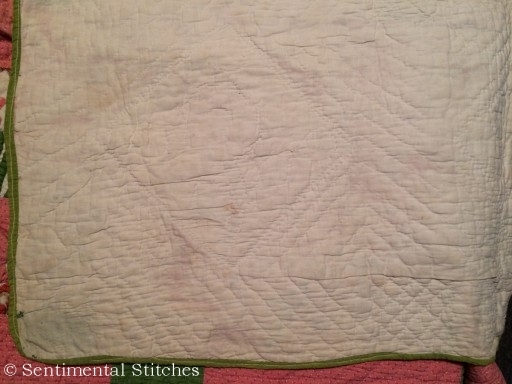 If you're wondering how Sally quilted and bound her quilt, here's a few pictures and a description to show you what she did. The binding is a narrow 1/4" solid color green. It was sewn on the back side and brought to the front, turned under and stitched down by machine. 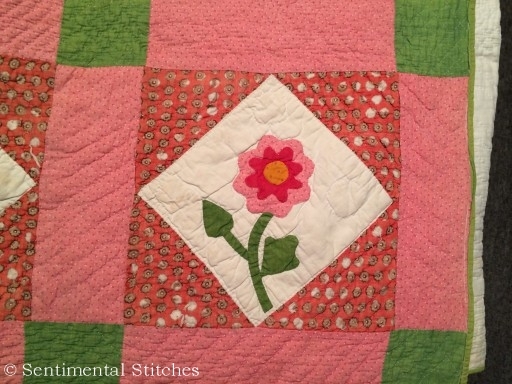 She outline quilted around the applique shapes and just inside the seam line of the block. 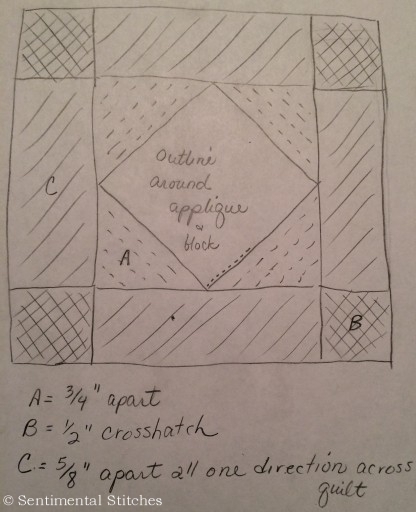 These lines are 3/4" apart in each triangle and go around the block. 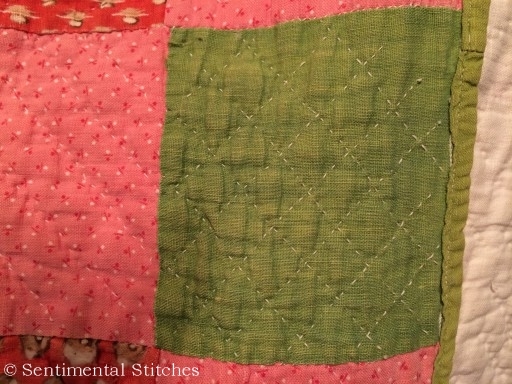 The cornerstones are 1/2" crosshatch quilting. This is the reverse side of the first picture. 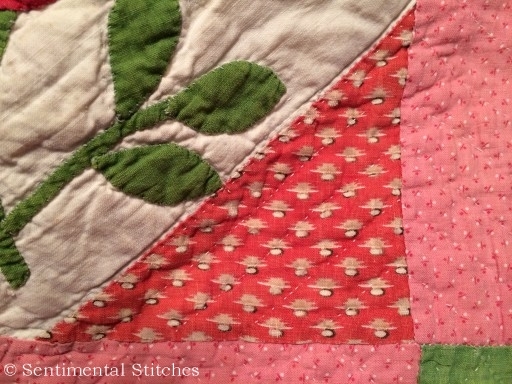 It's a little difficult to see the quilting on the off white background. 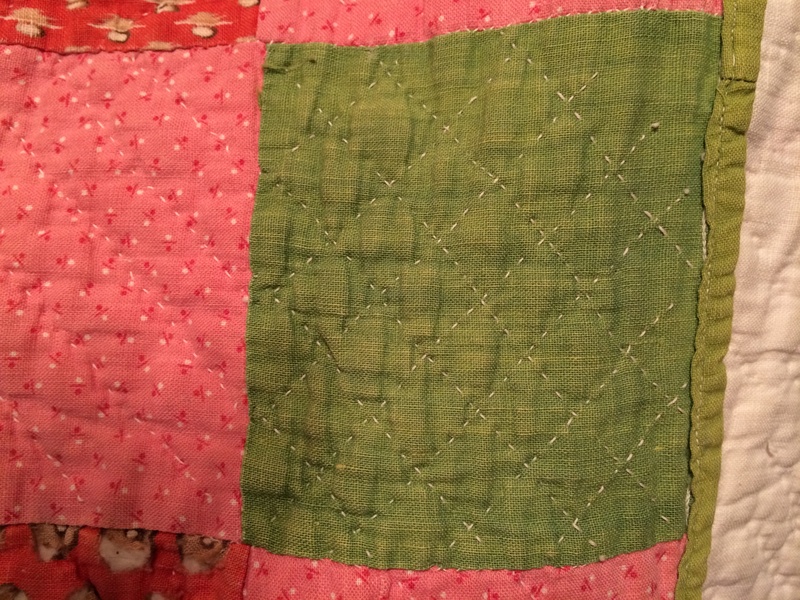 The sashing is quilted with lines 5/8" apart going in the same direction across the entire quilt. 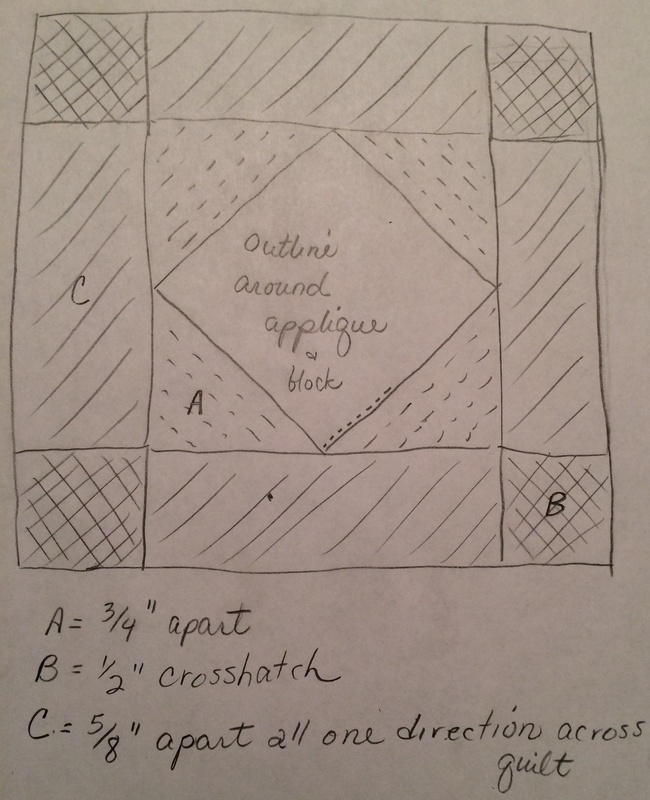 I drew this up quickly so you'd have something to use as a reference of a section in the quilt. 182 queries in 0.770 seconds.